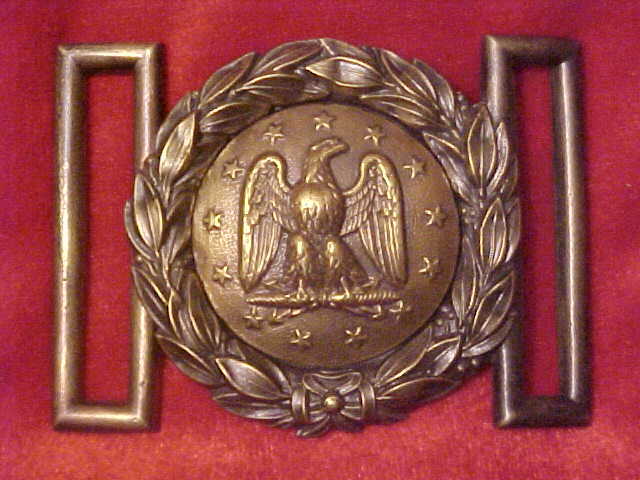 TG-Hood Brass Belt Plate with applied nickel silver flag & wreath. Made the rubber mold for the flag and wreath at The Museum of the Confederacy. 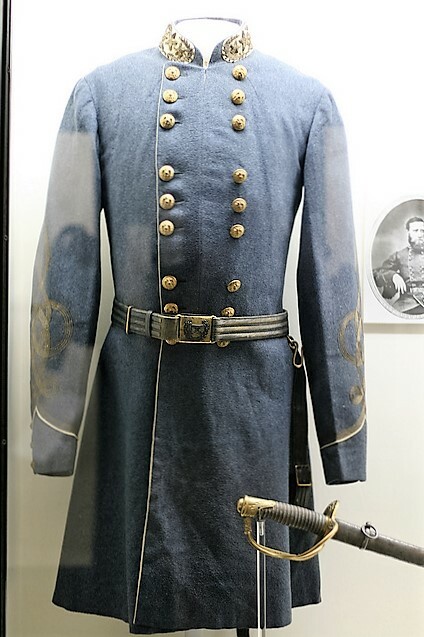 Hood's uniform and belt plate displayed in the Museum of the Confederacy. 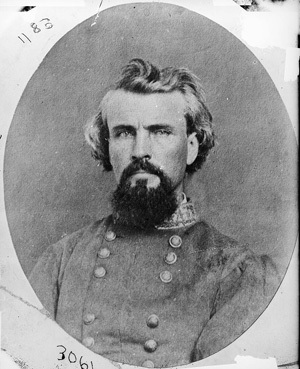 Nathan Bedford Forrest Lee said he never meet the man but he was the best. TG-Hood (2) Hood Belt Plate with applied nickel wreath. Not copied from the original. 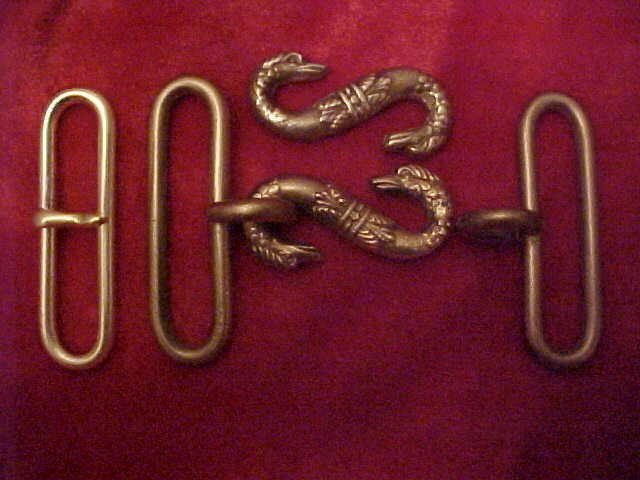 Father and Son wearing an Iron belt plate. 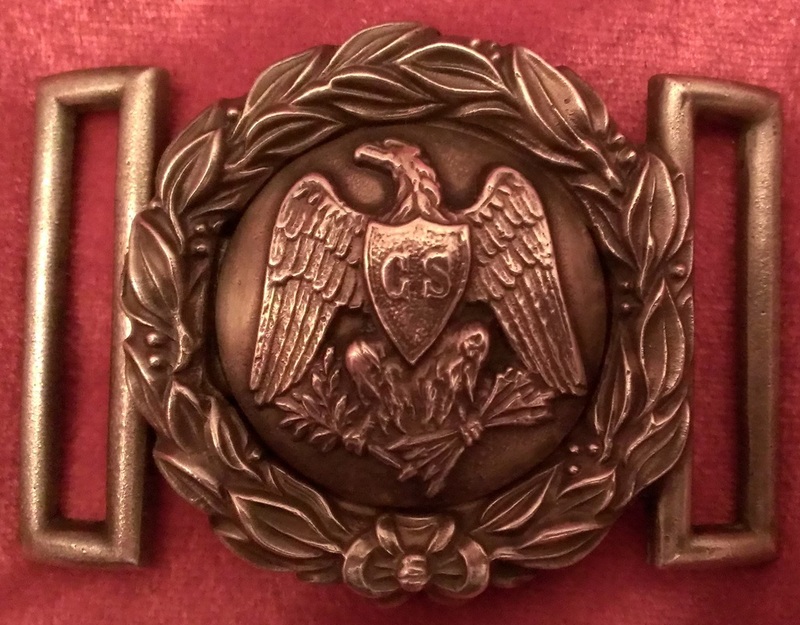 T - 35 Confederate Officers Belt Plate Circa 1970 FANTASY, I made up this two piece using a bridle rosette. TG-35 and TG-35(one) are cast from my original belt plates. 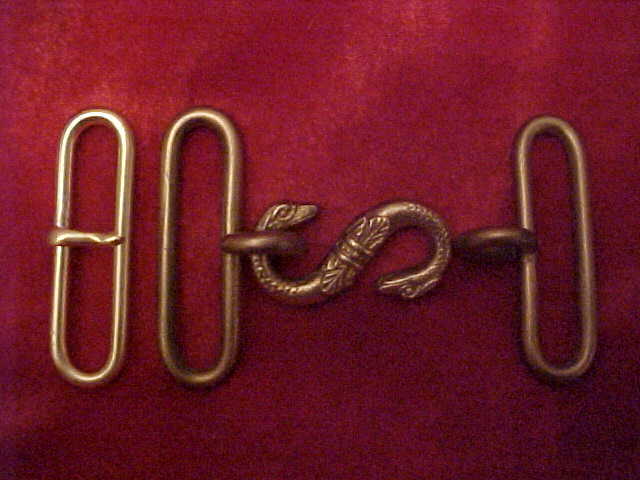 TG-36(A) Snake Belt Plate Original dug Cold Harbor battlefield. 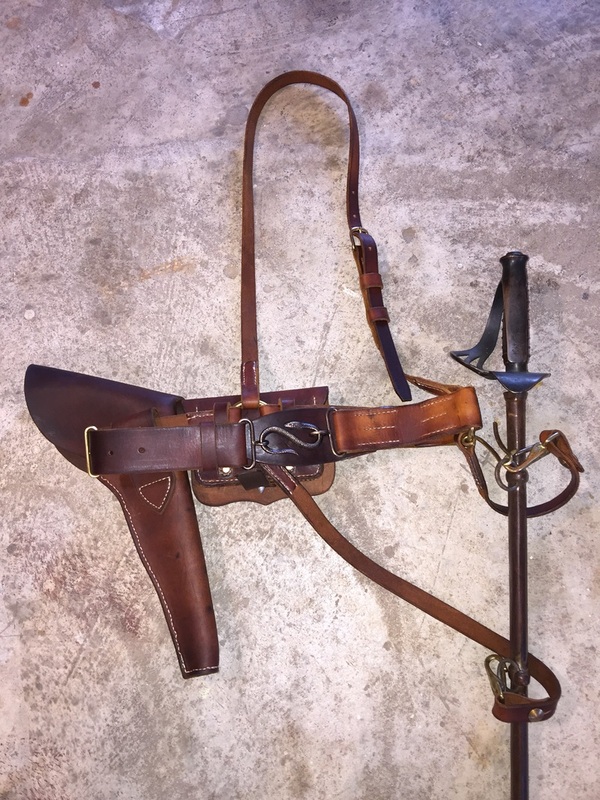 Customer used the Large TG-6 Snake to make his gun belt with sword hangers. 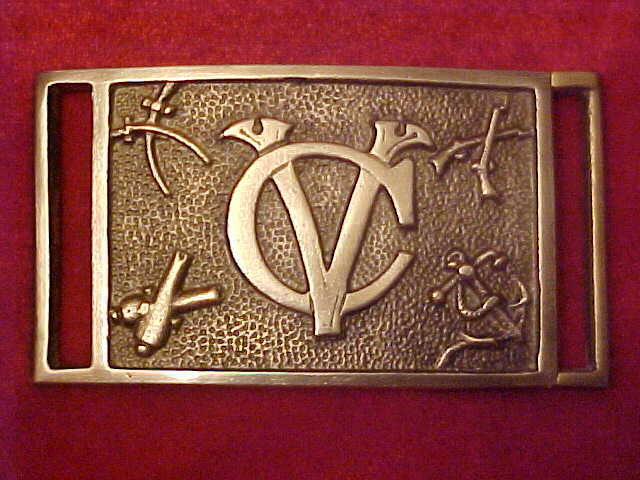 English Snake Belt Plate on the original belt. 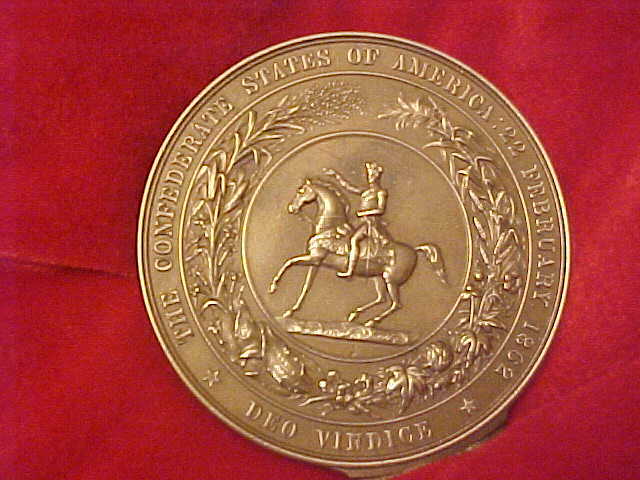 Run through the blockade and used by Union and Confederate. 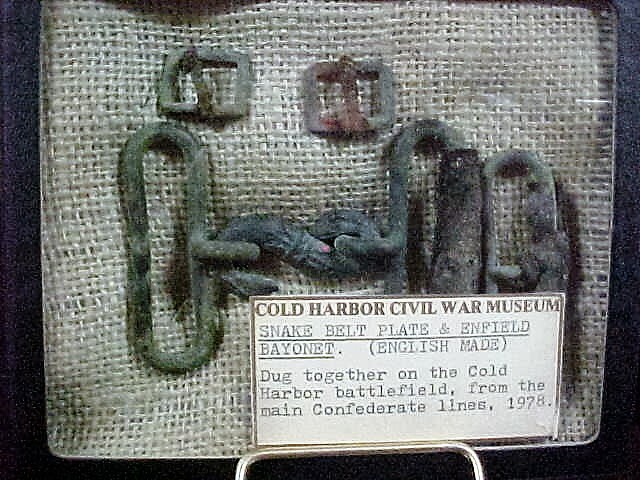 Snake Belt Plate with remains of leather belt I dug from Cold Harbor. 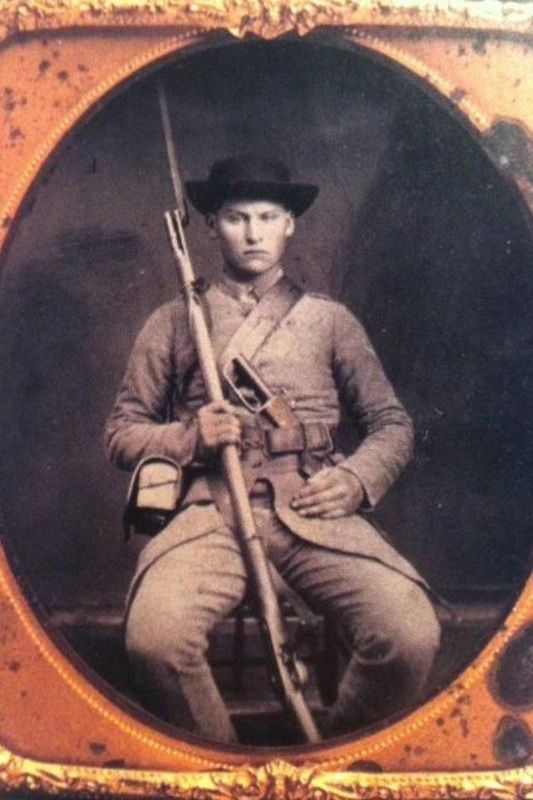 Dug another Snake in the same Cold Harbor trench line. 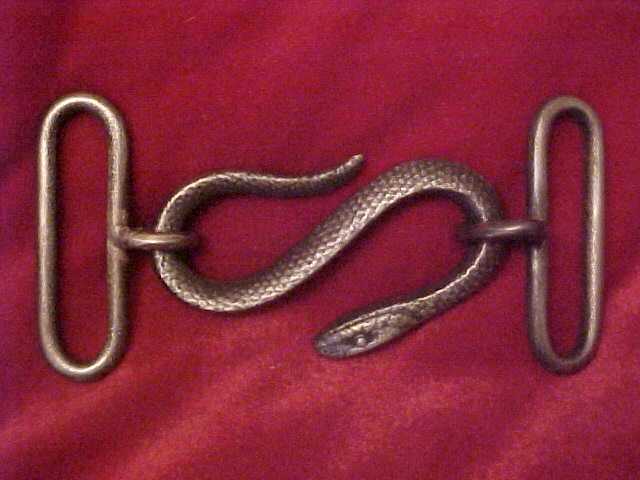 TG - 6 Inch Snake Belt Plate Original dug Shiloh, TN. Battlefield. 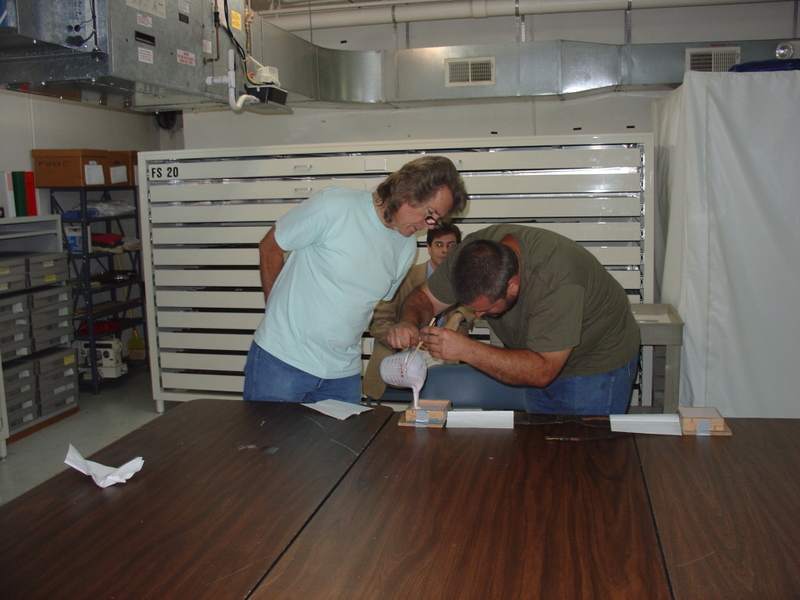 Pouring the rubber mold at The Museum of the Confederacy. 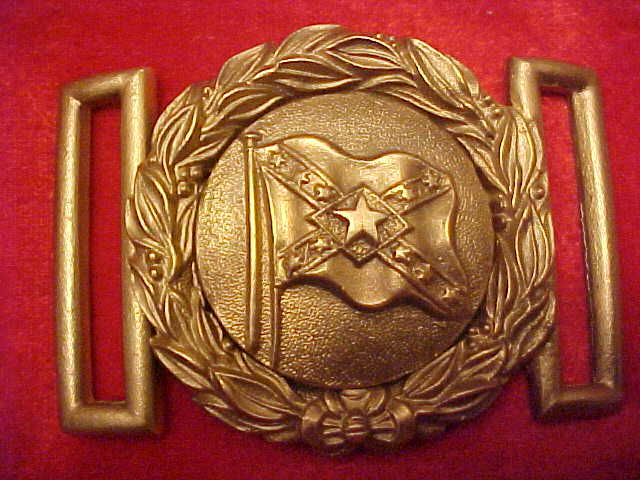 TG-C.S.Flag Rebel Flag Two Piece Belt Plate. Limited Edition yellow brass two piece with nickel silver flag applied to the center disc. 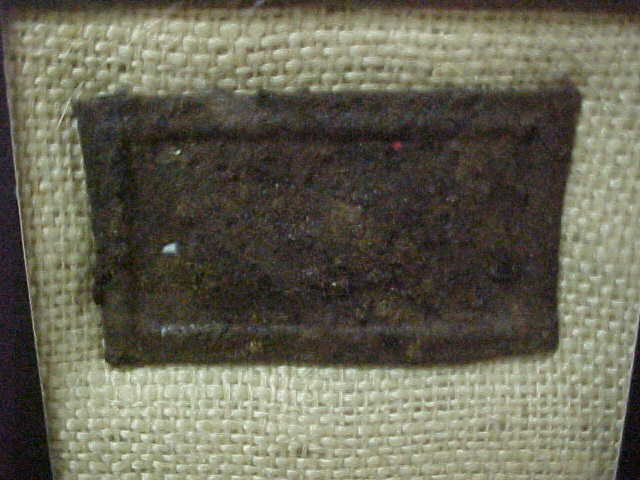 Blockade type belt plate. 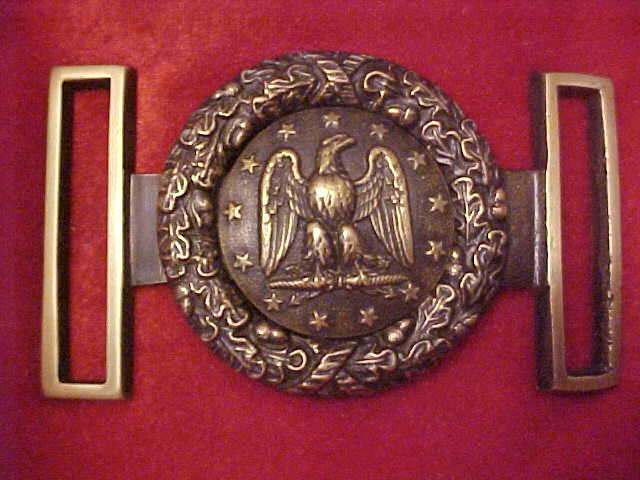 TG-36(C) Snake Belt Plate original dug (Seven Days Battle, Cold Harbor, VA). 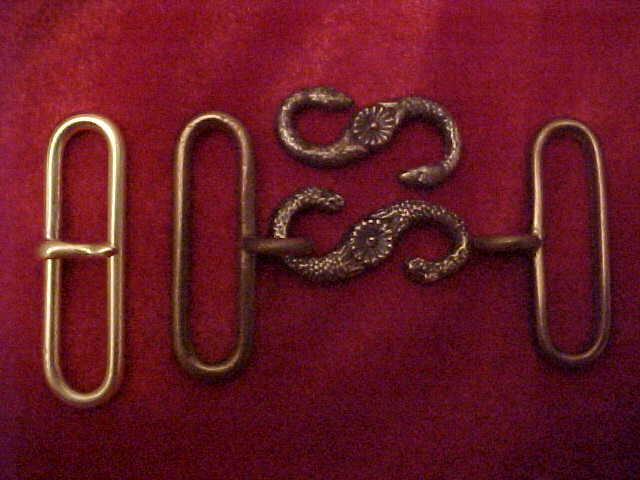 This comes with the adjustment bar; however, the extra snake pictured is to show pattern I use for casting. 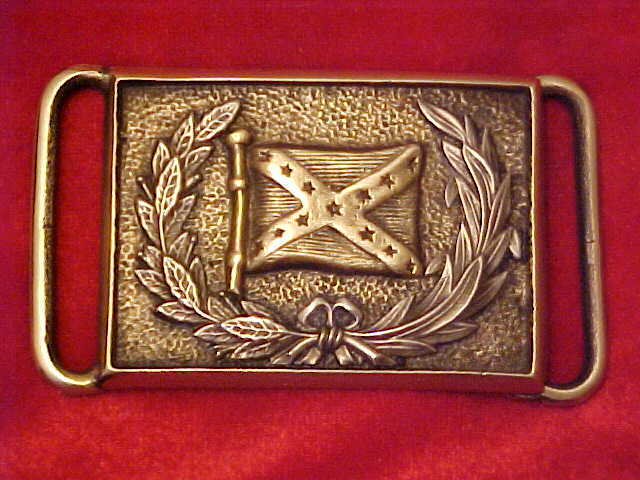 TG-Shield CS-Gold/Silver Confederate Officers Blockade Belt Plate. 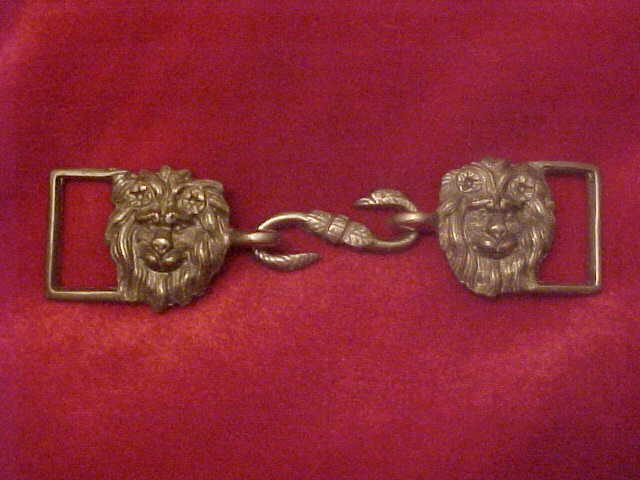 Silver over 24kt Gold plate. 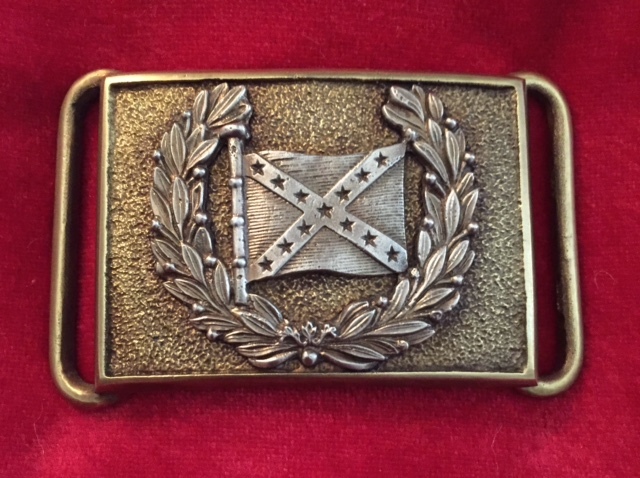 Original Confederate Flag belt plate and beautiful belt. 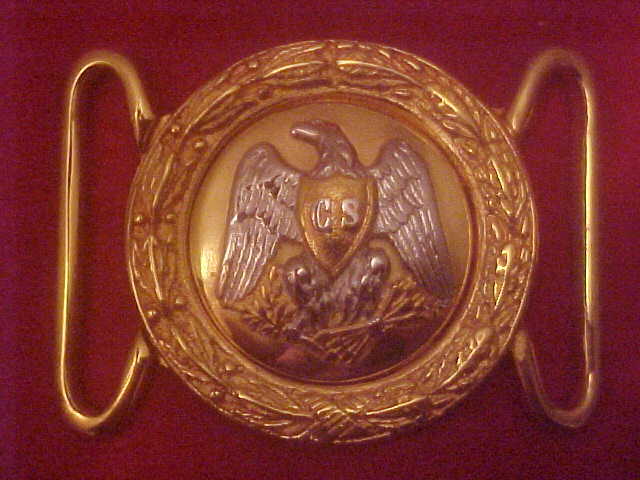 TG-CS Shield(2) Two Piece. 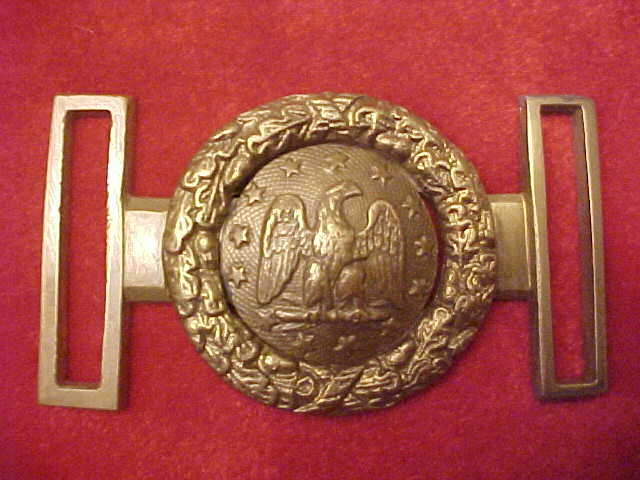 Blockade Belt Plate. 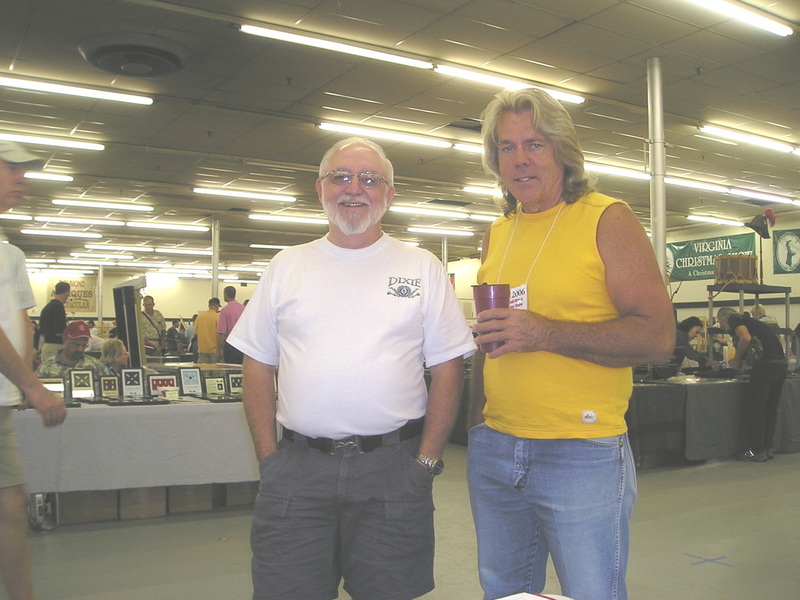 Phil Hughes on the left is an old time relic hunter. 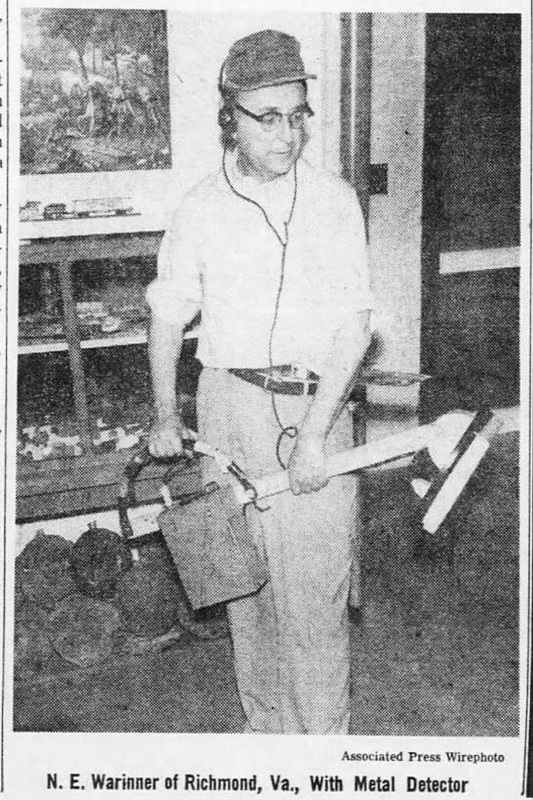 We use to dig in the early days and he once had a beautiful collection. 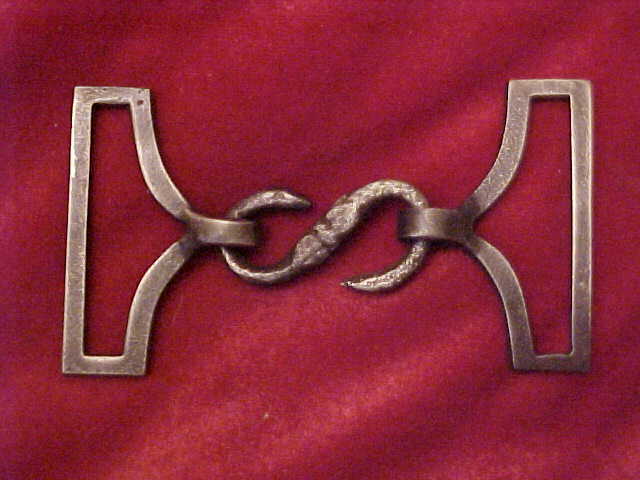 TG-36(B) Snake Belt Plate. 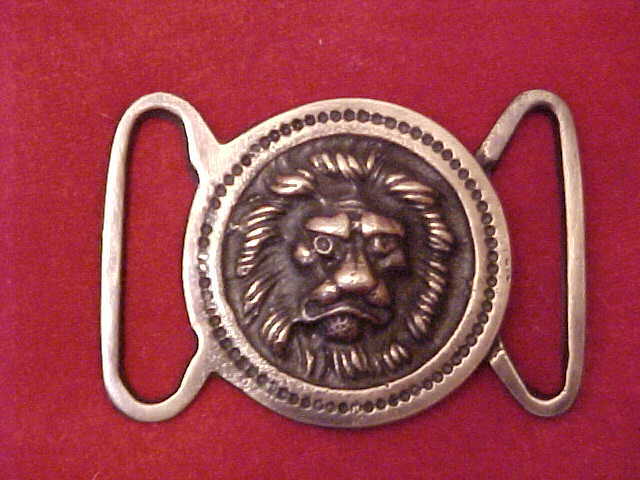 Front and Back of this buckle pictured here. 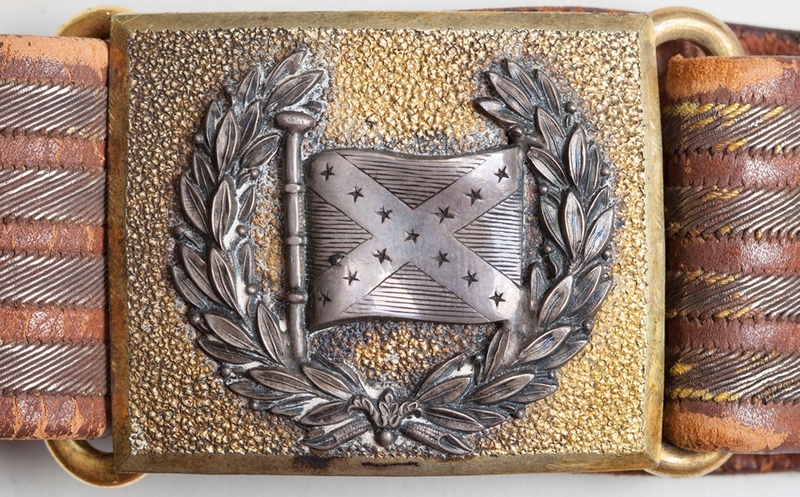 Original Iron Belt Plate worn by a Confederate early in the war. A rare plate that I dug from the Malvern Hill battlefield in the 1960's. 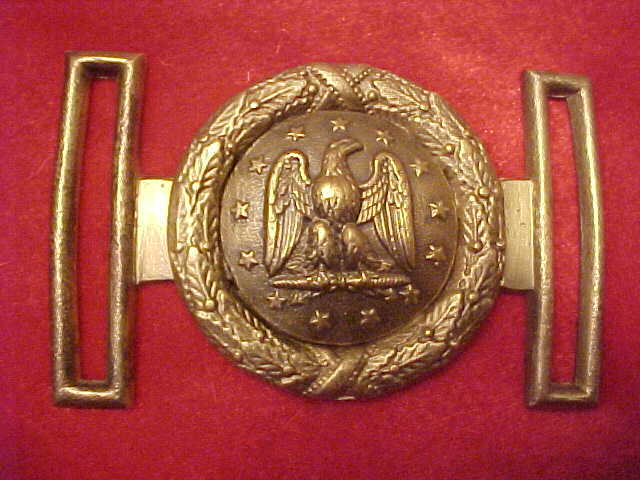 Johnny Reb wearing a Blockade Snake Buckle. 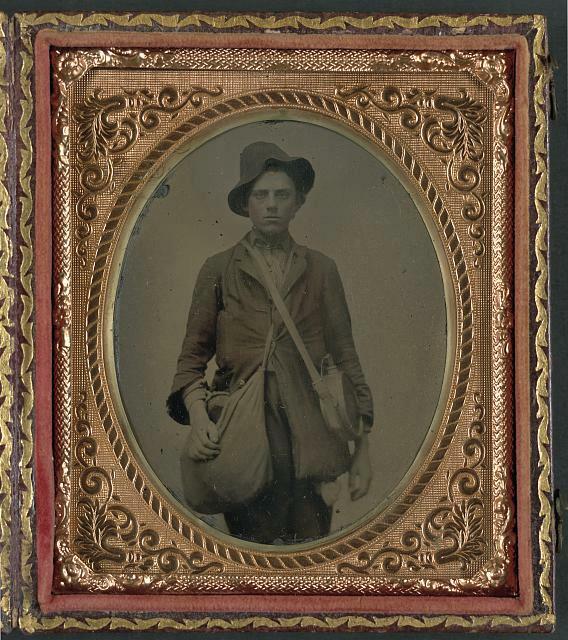 Confederate Officer wearing a Blockade Snake Belt Plate. 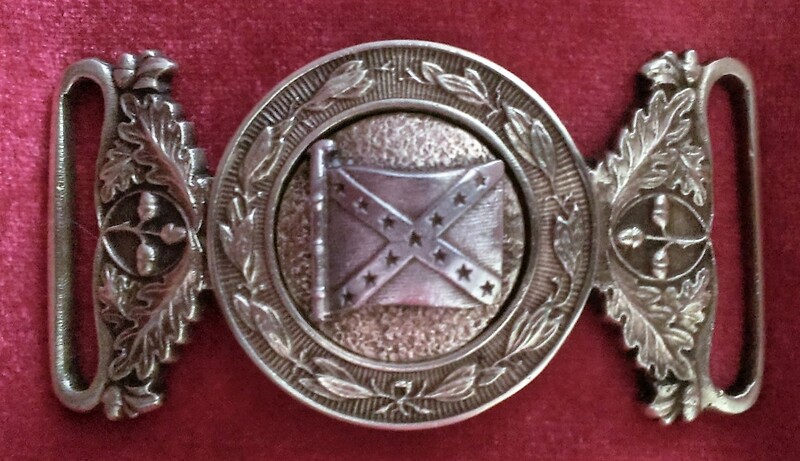 Original (Confederate Flag Belt Plate) Type worn by Hood and made in England. Front and back with the London company that made these plates. 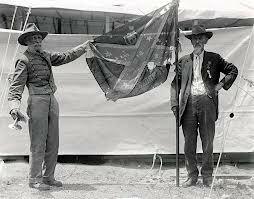 Note how the silver flag and wreath were attached. 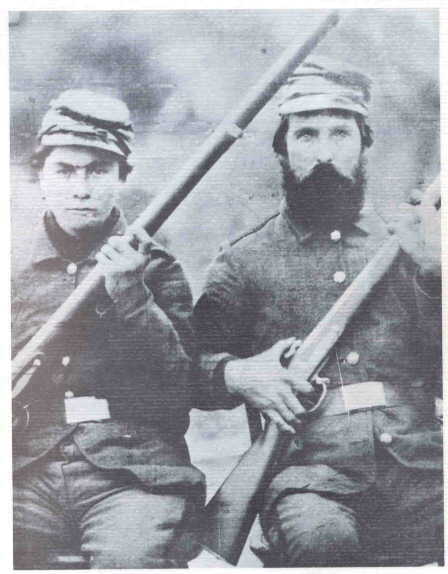 A Confederate ready for battle. 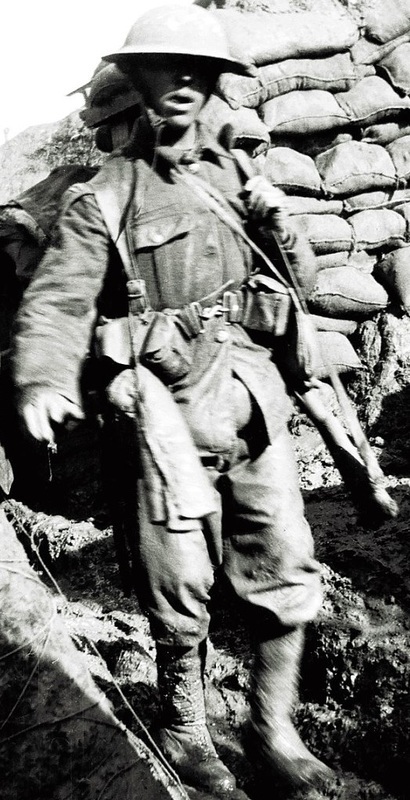 Note the wood canteen. 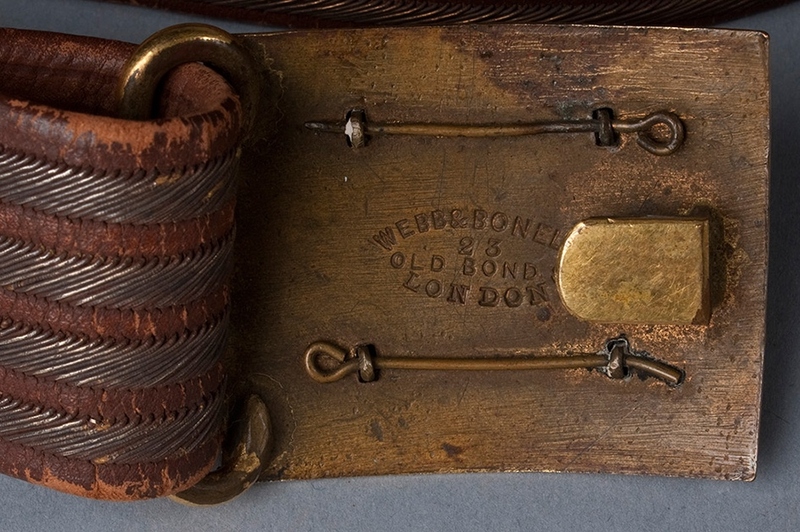 WW 1 soldier wearing a Snake belt plate. 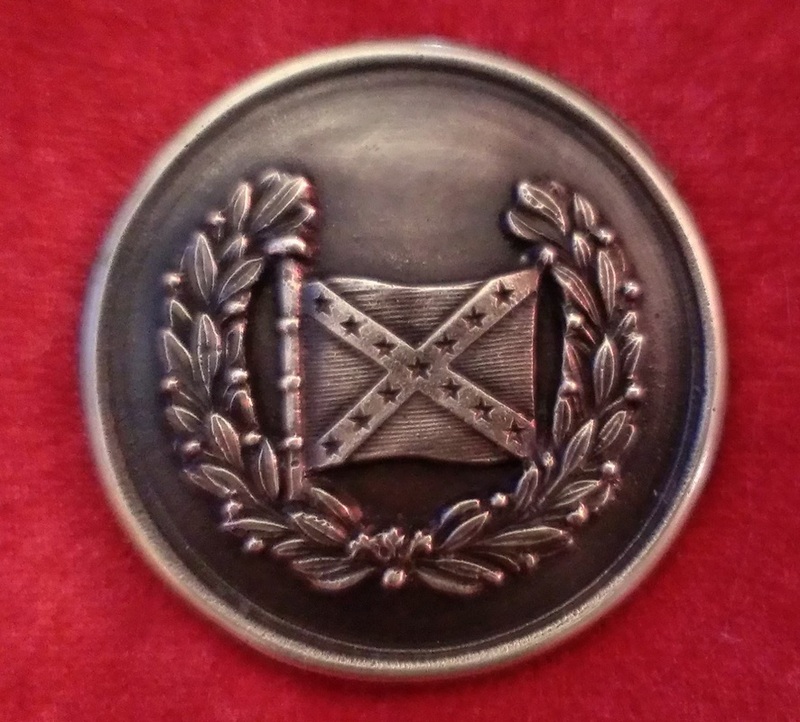 G- 96 Great Seal of the Confederacy Circa 1861- 1865 (Seal is 3 1/4" across and can be cast with buckle hooks or without). 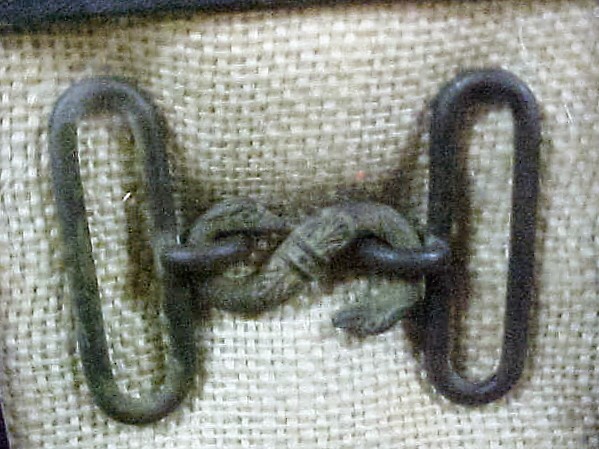 TG-Shoulder Strap Buckle Canteen Shoulder strap buckle used to carry the canteen or any other item worn over the shoulder. 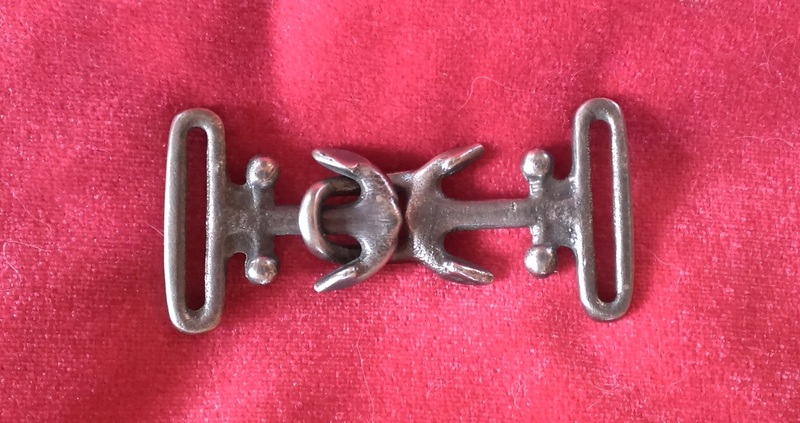 This two piece buckle was used with a Confederate Wood Canteen.